You can see several of your Google Reader subscriptions at once by putting multiple Google Reader gadgets on your Personalized Homepage. Each gadget can display a different folder or tag in your Reader subscription list. If you use Google Reader (it's worth serious consideration!) and you're not using the Reader gadget on your Personalized Homepage, you're really missing out. This miniature interface to the full version of Google Reader is extremely useful, with pop-up "bubbles" for quick reading, the ability to switch between your folders & tags (but sadly not individual subscriptions) and smooth scrolling, all without taking you away from your homepage. You can multiply the benefits of using the gadget by putting more than one on a single homepage tab. 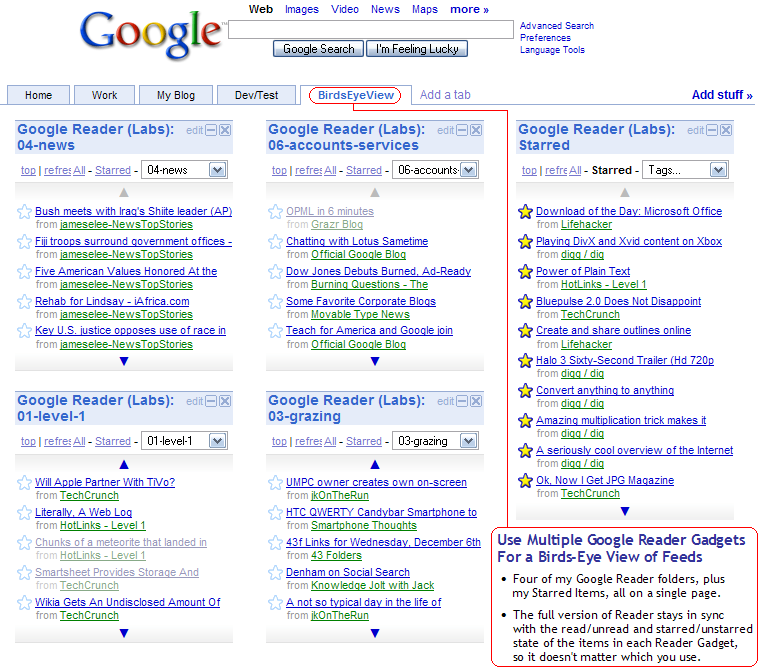 Look at a single page for a "birds-eye view" of your Google Reader feeds. Scan the latest headlines or read entire articles right from your homepage. You don't need to go to Reader to see your feeds. You can get a quick update on several feeds at a glance, right from your homepage. If you want to read more than a headline, just click on it, and a "bubble" will pop-up and display the entire article. It's lightning fast, and you don't leave the homepage. Syncs with full version of Google Reader. All the Reader gadgets stay in sync with your full version of Reader, so if you read or star something in a Reader gadget, it'll be that way in the full version, and vice versa. The basic feed gadget doesn't do this, since it has nothing to do with Reader. This is a key feature, and it's worth highlighting: I can use the full version of Reader, Reader gadgets, or Reader Mobile to read feeds from almost anywhere, and state is always maintained. That means there's no downside to any of the methods, and it makes reading feeds easy and efficient. Manage just one set of subscriptions. You've long been able to put multiple basic feed gadgets on your homepage, but if you do that and use Reader as your primary feed reader, you've got two sets of subscriptions to deal with. The Reader gadget uses the subscriptions you're already managing in Reader. Add a Google Reader gadget, press the Back button, add another, repeat. It's that simple. Tip: Create a separate tab. If you plan to put multiple Reader gadgets on your homepage, you may want to start by making a separate homepage tab for them. Once you've done that, make sure you've got that tab selected, since gadgets get added to the current tab. Find it. Find the Google Reader gadget in the Homepage Content Directory. (You can either click on the link here, or go to your homepage, click on "Add stuff", and search for "reader"). Add it. Click the "Add it now" button. This will take you back to the Homepage Content Directory, and you'll see a "Back to homepage" link at the top left of the page. Do not click that link yet. If you are not redirected to the Homepage Content Directory, you'll probably see the "Add it now" button disappear, and in its place, a check mark next to "Added". If you see that, you should be able to reload the page, and skip the next step. Go back. Use your web browser's Back button to go back to the previous page. Add it again. Click the "Add it now" button again. Repeat. Repeat the two steps above until you've added as many Reader gadgets as you want. End. After you've added your last one, click on the "Back to homepage" link. Each Reader gadget is an individual. You may find that you want different behavior for different feeds, depending on what they contain or how often they update. Try configuring gadgets to display various numbers of items, or changing whether or not they display items you've read. See what you've starred. I star articles to highlight them for further reading or action. Putting my Starred Items on my "BirdsEyeView" tab ensures I don't forget about them, and makes them quick & easy to access. You can scroll within each gadget. If you want to see more than the max of 10 items per gadget, you don't have to open Reader, you can just click on the up/down arrows, or hover over the gadget and use the scroll wheel on your mouse. I've become a strong advocate of Google's Personalized Homepage, and an was instant convert to Reader as of it's redesign. I'm really impressed that the two work together so well, and the developers of both should be proud. Enable us to choose individual subscriptions to display in the gadget. Currently, the gadget allows us to choose a folder or tag to display, but not individual feeds. (Each "folder" in Reader is a mix of the feeds it contains.) I know "river of news" style feed reading is all the rage, and it certainly has its benefits (I've advocated feedmixing myself). That said, it would be nice to be able to specify a particular feed to display in a gadget, just as we can do in the mobile version of Reader. Dave Barnard's comment that he'd like to be able to customize what shows up on PopUrls. Almost anything can be read by RSS feed, so you can display almost anything on a startpage. These services fulfill a very specific function for a person working on the web - they provide a one click view of updates from various sources, inside the browser and distinct from the more heavy duty environment of a feed reader.